I never thought.... I've been saying that quite a bit lately. I never thought so many people would send me halters, lead ropes, wormer, syringes, and even hay. I never thought that so many people would paypal or drop a check in the mail to validate what I do and help with the gelding costs on these 6 intact male llamas that need to be done immediately. So far, in monetary donations we have close to $750 towards their gelding. I called the vet today, they originally couldn't get the guys gelded until April 8th but they are going to squeeze them in tomorrow for me. Four of them will be able to go out with the herd that they are familiar with by this weekend. The other two studs will probably have to be confined longer to cool their jets before they will go out with the herd and be "civilized". The computer emails and the phone continue to bring pleas for help ... there are sheep, geese, and several more llamas coming in but none are emergencies and I would prefer to blog about what is here--not what is coming. I never thought that a bunch of guys in their early 20s (most were High School Volunteers here) would want to stand on scaffolding 12 foot in the air and work on the ceiling of the indoor part of our new raptor facility. We have just about 100 feet of the ceiling done. This weekend, between our two fund-raising events, we hope to finish the ceiling and get the 9 posts put in. Once that is done, we can finish individual pens as time and money allows. My goal is to have the 8 indoor raptor pens done by summer. The outdoor flight that is connected to the inside individual species aviaries will be the largest flight aviary in the Northeast (that I am aware of): over 100 feet of enclosed, open free-flight space. It will be crucial for rehabbing raptors (hawks, owls, falcons) for release back into the wild. Everyone has been very impressed with what we are doing here. I have a vision and we are well on our way there. It takes time and money--but doesn't everything? We have gotten a lot of interest lately from people of all ages that want to volunteer at our facility. This is no longer a one-man show and the volunteers have been a huge help keeping the constant facility expansion moving forward, and tackling a variety of other chores. "The guys" are probably not going to read this but if you do, thanks for giving up your weekends to keep the raptor center going. I am anxiously awaiting for my chance to rehab some black bear cubs but I wasn't expecting to do any seagull rehab anytime soon. :) I suggested that they try to get it in a box where it would be safe and told Sue that I would be there in 5 minutes. I actually went to the wrong Mobil Mart, (there are only 4 gas stations in Schoharie) first. I was beginning to wonder which one of my friends was messing with me when we pulled into the right convenience store with a box sitting by the door. The top of the box was open and I peered in to see a seagull looking back at me. It had anexpression like: "Where the hell have you been", and "Don't get any ideas pal". I reached in the box and got a good beak bite--much to the amusement of my daughter. After I got him off my hand, I did a "once over" and was happy to see that they were no broken wings or legs. Other than a pretty bad foot injury, the bird was not in bad shape. We got home and got him settled in; I am pretty confident that this guy will be releasable. I never thought that all of those people would just drive around a hurt gull in that parking lot on Main Street. One woman named "Sue" cared enough to get the seagull safe, call me, and do the right thing. I am fortunate: I get to meet a lot of people like Sue. 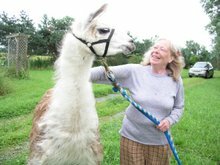 I also want to take a moment as I end this blog to thank Joan and Allan for adopting an alpaca. 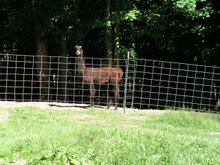 They have adopted a dozen llamas from me and they decided to add a camelid cousin to their collection. They also opened up their doors to 4 muscovy ducks that needed a home. They are great people and it makes it all worthwhile watching animals go home with them . I never thought when I started saving animals as a kid that it would progress to this. I never thought that we would grow to be the not for profit facility that we are today--with the help of our Board Of Director, volunteers and supporters, I look forward to the next several months of further expansion. People that know me well know that I have two weaknesses. Kids and animals are two of my favorite things in the world: the ability to be young and have fun; the right to be born free and live wild. In the years that I have been doing rescue work, we have saved thousands of animals. I have an open door policy on just about any animal that needs help. I do have limits on the number of horses, dogs and cats that we can take in. If I had an open door for dogs, cats and horses we would be overwhelmed and bankrupt overnight. There are lots of other facilities that specialize in these areas ... my resources are best utilized on barnyard domestics, exotics and wildlife that most other facilities can not take in. If you have ever read any of my older blogs, you would also know that I usually travel with a pack of dogs around me. There is Lucky, a Golden Retriever who was abandoned in our kennel while boarding here. Our Great Dane is Cleopatra; Cleo is not the smartest dog we have ever had but she loves to sit in your lap and be loved. Otis "P" Mister is a little terrier mix that a dog warden brought to our grooming shop and asked if we could find him a home. I am sure we could have found him a home if my kids didn't keep him hidden in our house whenever a customer came to pick up their dog. Our last dog is Austin, my Border Collie; I belong to him and he is my shadow. 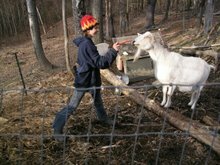 There is not much that goes on at our farm without Austin in the middle of it. I have always had a weakness for Border Collies (read my older blogs) and I love a smart dog that is a challenge. Austin is my best friend and best companion. Austin makes sure that I get up after one hit of the snooze button in the morning because there is work to be done and he has been looking forward to getting it done all night. I recently got an email from a former student, one of my favorite kids. They have a Border Collie that they need to place. I didn't ask any questions, but they have to leave their house and move into an apartment. She was wondering if I was interested in taking Casey. If it had been any other kid, or any other breed of dog, I would have helped find the dog a good home and gone on with my life. I said that we would talk about it (she emailed back). I told her that maybe I should meet Casey sometime (they came over last night). Casey was not what I expected. As their car pulled into the driveway, it appeared to be heavy in the rear. It had the happiest Border Collie in the world in the back. BC's love to ride and it doesn't matter on what. If it moves they are on it, in it, or chasing it. After brief introductions, the fattest Border Collie I have ever seen in my life got out of the back of the car. Casey is the same size as my Austin but easily 4 times his weight. I was amused. It also amuses me that if I agree to take this dog, my best friend from High School has two sons ... named Austin and Casey. What are the odds? It must be destiny. Casey didn't realize it but his test had already started. If Casey is going to live at NY Wildlife Rescue Center there are rules. There are lots of them that are loosely enforced.... Our Dogs need to: love all people (even ones that are tough to like), not harass customers going in and out of the grooming shop, put up with my kids, walk past all types of loose animals, stay on our property, be within eyesight of me (that includes when I am in the bathroom or sleeping), be able to sneak into our house (when covered with mud) and go lay down so my wife doesn't yell, and never let my truck pull out of the driveway unless you are in the back seat (covered in mud) and hanging out the window. The rules are not limited to these. I frequently make up rules as I go along but none are too unrealistic. I will put up with a dog being a dog if they can handle the same of me. Casey said "hi" to me and then we took a tour of the farm. None of the pack really seemed to find anything at fault with him. Casey is smart, like most Border Collies. He didn't seem to be bothered by much on the farm. He responds to verbal and hand commands for: come, sit, heel, down, back-up and would shake or do just about anything else asked of him. I wish that we could have tried him off of his leash but it was too soon for that. Casey might come to spend 10 days with me over April Vacation from school. It is the logical time to "break him in" since he will have my attention 24 hours a day during that time. My wife doesn't know it yet but I think that we are about to get another dog. No, we don't need another dog: but what is one more when I walk with a pack of misfits already? The daffodils are creeping up. I've seen lots of robins and bluebirds lately. The long, icy winter is over and the "slow rescue season" has given way to my favorite season ... mud season. I love watching everything come back to life.There really isn't a slow season anymore at Red Maple Farm. We are doing rescues every day, all year long, usually around 400 animals a year. We never have a day off. We even had a duck come in on Christmas morning. With our current economic recession, I've been getting lots of calls from good people that are in over their heads financially. I think that it is amazing that these people are struggling to survive yet they care so much about their animals that they know that they can no longer take care of them and want to get them in a better spot--versus a livestock auction ... or watch them starve. Spring is our busiest season of the year and I look forward to the orphaned wildlife that will be arriving shortly. One of my students told me yesterday, at school, that the bears are out of the dens and on the move again. I am hoping this year to have the opportunity to rehab bear cubs. We have started building the second phase of NY Wildlife Rescue Center. Last year, we put all of our time and donations into building a beautiful mammal area. This year, we have already started to build our raptor center for hawk, owl and falcon rehab. We are building the indoor facilities for eight species right now, as donations keep coming in. By fall, I hope to have the 150 foot outdoor flight completed. We rescue a lot of birds of prey. All of the rehabbers that network through this facility do a great job with the animals that we get in. I've always thought that birds with wing injuries should have a place to exercise before being released back into the wild. When completed, this facility will be the largest of its kind in NYS. 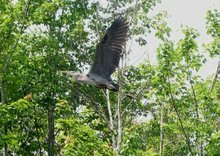 I believe that many NY State Wildlife rehabbers will bring their birds here to finish recovery and then pick them up to take them back to where they were found for release. I should probably catch everyone up with 2009. One of my many goals this year is to blog regularly to let everyone know what animals have come in--there are so many stories to tell for each animal. New Years Eve started with a baby lamb born to the Alaskan Dahl Sheep that I picked up last fall from another rescue facility. New Years Day, we received a small whitetail deer that was hit at Crossgates Mall. One of my students saw the deer get hit, thought it was dead and was going to throw it on the back of his truck, take it home and eat it.... The poor fawn must have thought that it was the lead character of a bad horror movie when it came out of shock on the floor in the back seat of his truck. I really wouldn't suggest putting a deer in your vehicle that has been hit by a car. I actually had two women bring me a fox in their trunk last fall (which I really wouldn't suggest either) but that is a story for my book. The beginning of January was busy. I got a call from a guy that had a skunk in his woodshed that he wanted evicted. I set a live trap and have caught a lot of interesting things but still haven't caught the skunk--but I will. This time of year is when we get a lot of animals hit by cars. They feed and travel by roads since there is less snow and more food. January 5th, we received a Screech Owl that was hit by a car. The student from my school did everything right but, unfortunately, by the time they got it to me it had died. A couple of days later, some great folks brought me a pileated woodpecker (one of the big ones) that had been hit by a car; it wasn't looking too good and died shortly after arrival. It is depressing to see such cool animals check out. Doing what we do, you really need to focus on the "saves" not on the "would have, could have and should haves". On January 8th, a DEC guy brought me a little Pine Siskin that was sitting by his bird feeder acting strange. I had a Goldfinch come in (no they don't always migrate) that had really bad conjunctivitis in its eyes. Over the last year, we have seen a lot of song birds come in with this eye ailment. It is fixable but it is fatal in the wild since they get blinded by the crust. The same day that the Goldfinch came we had a Coopers Hawk arrive. The folks rushed it to me and it was dead from the collision (by the sounds of things) with their deck sliding glass door. I don't know how close their birdfeeder is to their house but birdfeeders should be a safe distance away, yet close enough to enjoy the birds. This hawk was probably hunting the birds at their feeder. I love raptors. Talons and sharp beaks: birds that hunt prey intrigue me. On January 28th, I was enjoying a snow day from school and the blizzard that came with it. Right about the second cup of coffee, after am chores got done, the phone rang. It was a call from about 30 minutes away on an owl that was sitting in the middle of a busy road. I returned the call and reluctantly came off the mountain to creep towards the half way mark (where we had agreed to meet) for the pick up. The Barred Owl didn't look too good. It was very thin, lethargic, and I wasn't optimistic. I got it back to the shop and got some fluids into it with a lactated ringer and it started to come back to life. Kelly Martin took him to fatten him up with her Barred Owls and I had the privilege of releasing the owl back into the wild where it was found with the folks that had saved it. The slideshow is on our website: check it out. That is what it is all about; the reason why we rehab wildlife. We have had a couple of other screech owls come in, and some are still in rehab. One was actually taken out of the grill of a big rig by a trucker. In February, a DEC officer called me to give me the names and the number of some great folks that had saved a hawk. I met them part way, in a convenience store parking lot, to pick up the bird. Once I got up to fellow rehabber Kelly Martin's house we tag-teamed to see what was wrong with the bird. The Rough Legged Hawk isn't something that we pick up often. Part of the wing had been broken and we soon found a huge chest wound as well. The bird was stabilized and went to the vet the next day for surgery and still is in rehab. My gut feeling told me that it was a gunshot wound. It couldn't be proven, but it is a federal crime to shoot a bird of prey. I can't think of any reason why anyone would want to do such a thing. This bird is alive but it will most likely be unreleasable and will need to be put on our educational permits. The last two mammals that came in were Brown Bats. I think that they came out of their winter stupor a little too early and got cold. They will be released back to where they were found when the weather gets warmer. Do you know that 20% of the earths mammals are bats? I think that they are awesome and they save billions of dollars in agricultural damage by eating all of the bugs over our crops. Two things alarm me with bats right now. The first is the white nose disease that appears to be destroying certain colonies of bats. The second is the huge numbers of bats that are being killed in windmill fields. These are things that make you go "hmmmmmm". PS: Thanks to everyone that has been sending donations for the llamas that I just picked up. We also still need to raise a lot of money to keep going on the raptor center construction. Please tell everyone that you know about us ... all contributions are tax deductible to the extent allowed by law. See our sponsorship levels on our website and donate if you can, when you can. Thanks! There are good days and there are bad days when you run an animal rescue facility. 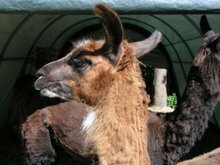 When I received the phone call from some folks 6 hours away that were having a tough time with the bank and needed to find a home immediately for 19 llamas I didn't think no ... I thought what am I going to have to do to pull this off? I've been on bigger rescues, I've driven longer distances to save animals. The details are always the toughest to work out. The first thing that I started thinking about was: where was I going to borrow a larger trailer to get them all in one trip. My trailer is too small to carry 19. The next thing that I was thinking: what muscle could I get to road trip with me; since there was no way I was going to wrestle 19 wild llamas in the trailer by myself? I found the trailer, Justin and Chris were up for an adventure--plans were made to take off for our mission at midnight on Friday night. We arrived at 6am as planned to get the llamas. I was hoping that they would be locked in the barn ... we could back the trailer up and be home bound by 7am Saturday morning. 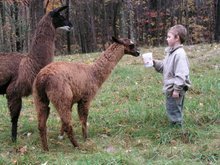 Llamas are an amazingly intelligent animal and have the unbelievable ability to foil the best of plans. Due to the fact that we've done this a couple of times, Justin and I had everyone on the trailer and we were back on the road with two heartbroken people standing in the driveway waving their goodbyes. It didn't take me long to figure out that these were not your normal llamas. They were in good shape but over half the herd stood for the entire six hour trip back home; very odd and not something that I've ever seen before. Normally as soon as the trailer starts moving the llamas kush (or lay down) but these llamas were not making anything easy or normal. We arrived back to the farm slightly behind schedule and really happy to be back. 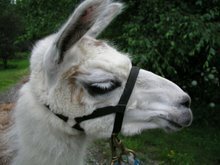 I decided that while the llamas were still on the trailer that they should get their worming shots. That went as I expected it would, it was not on the top of the llamas' list of things to do after a long ride but it had to get done. Now the fun part. 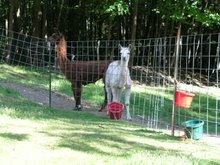 I don't let intact male llamas out with the herd until they have been gelded. Supposedly there were five intact males running with this herd. I started letting them off the trailer and running them down through the barn through a series of locks where I could sort off the males into pens and let the females out into the herd. My daughter Hannah (who is 12 and has rescued more animals with me than most animal shelters have) quickly volunteered for the Easter egg hunt and we quickly had seven males identified and separated. The one six month old male cria got a reprieve and got to go back out with his mom and the herd ... this still left us with six males, not five. The females with their crias (most likely rebred) have adjusted well over the last couple of days. They like their new mountain view and they are starting to settle in. They do not want to sleep in the barn and prefer to sleep out in the middle of a 10 acre pasture. I am starting to get into their heads and get to know them. You really don't have to be an animal communicator to pick up on their vibes. They know that I won't hurt them and they know that I helped them but they are very nervous and you can feel that they haven't settled into their new home yet. They are confused, don't understand why they are here and really would like to be someplace that they are more familiar with. If they only knew what their fate could have been. They have a lot ahead of them. They will be given the time that they need to settle in before I start halter breaking them. The first of the biggest two obstacles are over. of my checkbook as a teacher. We have to rely on donations because my vets won't come for free. :)  I have never been good at begging for money. We have become a not for profit facility now (not like any rescue facility ever makes a profit). The nice thing about this is that people that donate money to us can write it off as a tax deduction. 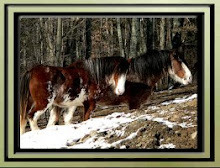 I am hoping that we can raise the money to cover the geldings this week so that I can get the vets here. 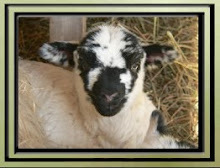 Once the males are gelded, we can handle the rest of their care, worming shots, vet visits, feed, shearing, training, etc. We have never turned an animal in need away and I don't intend to start saying no anytime soon. I really am flattered that so many of our supporters have sent a check. It really validates what we do that other people support us. 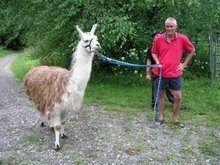 As soon as we get the  guys gelded and everyone gets settled in, I would love to teach anyone that would like to learn how to halter break a llama a few of my tricks to do that. Tomorrow I will try to write a blog on all of the wildlife that we have taken in over the last couple of months. It is my intention to get blogging again so that our friends and supporters can see what is coming in on a weekly basis and hear the story of those animals as well. Sometimes there just isn't enough time in the day for the computer when I would really rather be in the barn with the animals. Support NY Wildlife Rescue Center!